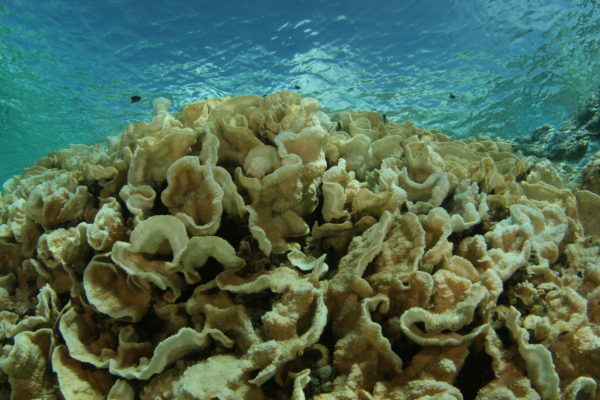 The abnormally warm water event associated with El Niño has been pummeling coral reefs worldwide. Last week the Sandin and Smith labs from Scripps Institution of Oceanography embarked on a rapid response expedition to survey the damage of the warm sea surface temperatures at one of our long term monitoring sites. Palmyra Atoll, a tiny island in the central Pacific, was in the pool of anomalously warm, potentially lethal warm water. But the team was hopeful that Palmyra’s coral reefs might not tell the same story as other more impacted reefs since they are highly protected (as a USFWS Refuge and a National Marine Monument) and lack local human stressors such as fishing and pollution. With some of the highest temperatures on record, the reefs of Palmyra did bleach in 2015 revealing haunting white landscapes, familiar across the globe. However, our team’s work on this remote island has instilled a feeling of hope for the future of coral reefs as many of the once bleached corals have since recovered. Our team visited Palmyra in September, 2015 and recorded the initial impacts of bleaching. We will return again in September, 2016. However, in order to document decline, resistance and/or recovery, we coordinated a rapid response trip along with the Nature Conservancy and the USFWS in May 2016 to capture a critical time point at the height of post-bleaching mortality. Many reefs across the Pacific from the Great Barrier Reef to Hawaii have recently suffered vast bleaching associated mortality, many that are also affected by local human populations, pollution and fishing. In order to understand the factors that facilitate recovery and resilience, we needed to document a bleaching event in action on a remote, uninhabited island. We sent team of 8 scientists to Palmyra for 6 days to assess the recovery of Palmyra’s coral reefs to the current warm water impacts of El Nino. On the first dive, it was hard to remember where the bleaching had been. The corals were full of color. 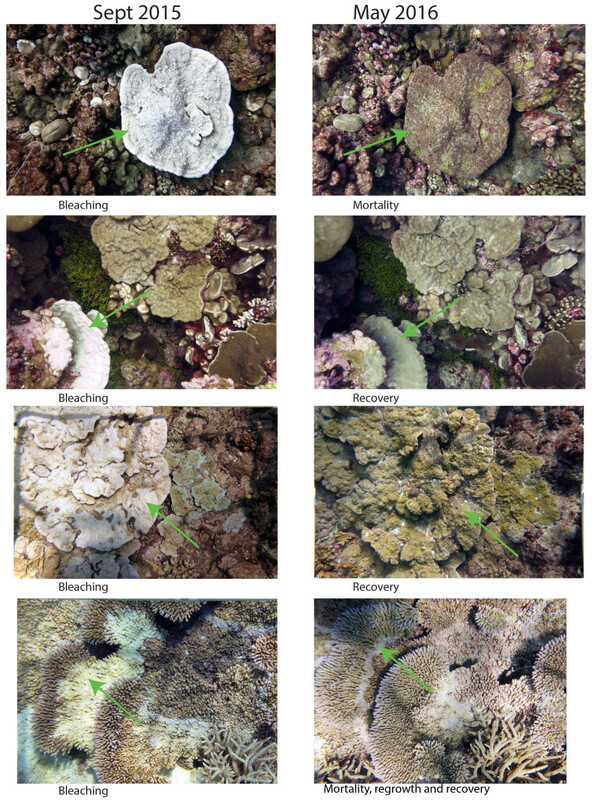 Dr. Jennifer Smith has been photographing the same corals on Palmyra for 8 years. Her photos reveal a refreshing new story about the ability of corals to survive this specific stressor. Many of the corals she monitored bleaching in the fall of 2015 looked recovered last week. Not every coral survived the warm water event unscathed, some of the large table corals, Acropora cytherea, suffered large areas of partial death. In order to examine large spatial patterns, Dr. Stuart Sandin is using state of the art imaging to map Palmyra’s reefs in 2D and 3D. The preliminary findings from the divers last week are hopeful and show that Palmyra’s corals showed all possible scenarios: some of the bleached corals died, some suffered partial mortality but are already showing signs of regrowth and some recovered entirely with no evidence of mortality. Palmyra Atoll appears to have survived this unusually warm year surprisingly well. However, this does not mean that Palmyra or any remote, uninhabited island is immune to future warming, large-scale bleaching and mortality as the outcomes will be the result of the magnitude and duration of the warming event in addition to the local conditions. Given what our team has seen to date we are excited to learn from Palmyra’s reef communities to understand how the rates and patterns of regrowth and recovery influence resilience and hope to use this to better understand how reefs of the future will look given future global change.